A Palace on Wheels journey is one that remains with you long after the experience itself. The Maharaja way of royal living can awesomely be yours, now at only $3500. And remember, every minute you spend after reading this and not making a booking, you stand the risk of not getting the reservation in time! Rediscover the Romance of Royal Rajasthan aboard India's first and most revered luxury trains. Chittorgarh Popular for the tales of valour and romance of its erstwhile royalty, Chittorgarh was the former capital of the Sisodia clan of Mewar. Placed on the banks of rivers Gambhiri and Berach, this city has magnificent forts, ruined castles and glorious royal structures. Chittorgarh has a total of 7 huge entries. Arrival in the Safdarjung Railway Station. Government GST of 5% Extra. Commercial Tax of US$ 15 per person Extra. 10% Surcharge extra for Xmas & New Year departure. Discounted tariff for travel in months of April & September, due to warm weather conditions in Rajasthan. Children older that 12 years charged @ 50% of adult cost on & provided bed. Children 5 years & below charged @ 10% of adult cost, but not provided bedding facility. Maximum three persons can travel in one cabin. Indians / NRI's can pay in equivalent INR Rupees as per rate of exchange on R.B.I website. Entrance fees at all monuments. Pre-paid group excursion & sightseeing trips in air-conditioned coach with services of English Speaking Guide in each tourist town visited. Bed Tea & Daily 3 meals. Elephant joy ride in Jaipur, Jungle Safari by Canters in Ranthambhore; Sound & Light show at Chittaurgarh Fort; Boat ride in Udaipur, Camel joy ride in Jaisalmer, Cultural Program in Jaisalmer & Cycle Rickshaw ride in Bharatpur. Consumption of Alcoholic & Non- alcoholic Beverages. Laundry; Room Services; Telephone Calls; Wi-Fi/Modem; Spa Saloon; Tips; Porter charges, Tour Insurance & all other expenses of personal nature. Hotel stay in Delhi, Air tickets to India, arrangements for Visa to enter India. Charges of the business car facilities are not included in the tariff. Royal platter at Jai Mahal Palace. Royal lunch in Udaipur's City Palace. Experience sundowner cocktails, cultural dance and dinner at the sand dunes in Jaisalmer. Birding in Keoladeo National Park, Bharatpur. Sightseeing of Taj Mahal and son et lumiere. The Palace on Wheels has been rated 4.5/5 based on 19 customer reviews on the website of Indian Luxury Trains. Find the details of Palace on Wheels scedule for the season 2019-20 mentioned below. No Train Tour service from May to August, due to annual maintenance. Check-In formalities of train tour start from 4.15 p.m. onwards on Wednesday, at Safderjung Railway Station, New Delhi (train departs at 6 p.m.). Check-out,next Wednesday Morning before 0715 a.m. at Safderjung Railway Station, New Delhi(train arrives by 5.00 a.m.). Jaipur the largest city of Rajasthan is an epitome of vibrancy and magnificence. The royal legacy of Jaipur is rich in culture, heritage and architecture. The city is rightly titled as the 'Pink City' for the color of the stone used extensively for construction within the walled city. Jaipur with its majestic palaces, splendid fortresses, beautiful havelis and tranquil temples make for an idyllic tourist destination. The tranquility of lush gardens housing these intimidating forts and palaces further add to the landscapic beauty of Jaipur. The erstwhile abode of the 3 most influential dynasties of the medieval world, Agra is worth visiting. The world famous Taj Mahal is the epitome of eternal love and the finest specimen of the amazing Mughal style of architecture. Apart from this, there are numerous other Mughal structures in Agra that are unique and reflect the taste and talent of the Mughals. Fatehpur Sikri and Sikandra are also worth a visit as these also encompass the unique Mughal architectural style. Apart from the monuments, the colorful markets, selling beautiful artifacts, overwhelm the visitors. Jodhpur is the bestowed with the title of 'The Sun City' as the sun shines almost every day of the year. Situated on the edges of the Thar Desert, it is mostly referred to as the Gateway to Thar. Being the second largest city of Rajasthan the city is divided into two parts- the old city and the new city. The major tourist attractions of Jodhpur include Jaswant Thada, Mehrangarh Fort and Umaid Bhavan Palace. The other major attractions that easily draw the eyes of tourists include Kailana Lake, Balsamand Lake and the Mahamandir temple. The lake city of Udaipur, once the princely state of Mewar, is rightly tilted as the 'Venice of the East' and, in reference to Dal Lake of Kashmir, it has earned the title 'Kashmir of Rajasthan'. Situated in the mid of lush hills of Aravali along the turquoise waters of Pichola Lake, the stunning landscapes and mesmerizing architecture of the city make it a must-visit destination not only for Indians but also for visitors to India. The major highlights of the city include visit to City Palace, Pratap Memorial and the Saheliyon-Ki-Bari. Besides this the other attractions to savor while being in Udaipur include Jagmandir. Chittorgarh, previously known as Chitrakut, signifies the gallant story of the beautiful princess Rani Padmini. The rustic town of Chittorgarh showcases love, beauty, bravery and grace at the same time. Legends suggest that Rani Padmini was the reason why Sultan Alauddin Khilji conquered the kingdom of Chittorgarh. Tourists to Chittorgarh are fascinated by its formidable past and the presence of the historic monuments including ruined castles, impressive forts and magnificent royal buildings. Jaislamer is titled as the 'Golden City of India' for its yellow sandstone structures. The city is widely known amongst tourists for its close proximity to Thar Desert. The city is best known for its old mansions better known as havelis. 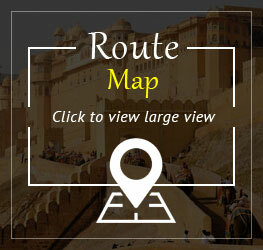 The dominant highlight of the city is the Jaisalmer Fort, locally known as Sonar Quila. Unlike most of the forts in India, the Fort of Jaisalmer is a living fort featuring shops, havelis and hotels inside the premises of the fort. Of the major tourist attractions of Jaisalmer include medieval Havelis, of which Nathmal ji ki Haveli and Salim ji ki Haveli are the most popular. Sawai Madhopur is renowned due to its historic opulence. The Ranthambore Fort and the Ranthambore National Park make this Sawai Madhopur a sought-after destination in India. The national park is the best option to spot tigers, performing their natural activities, as about 34 adult tigers and 14 tiger cubs were spotted according to the survey of 2008. Apart from this, the national park is a favorite destination of ornithologists, where they get to spot 300 species beautiful native as well as migratory birds. The national park is adorned with chirping birds and is the perfect retreat for the nature lovers. Advice Names/ Nationality/Date of birth of all the passengers with preferred date of journey to process booking. Booking will be confirmed on receipt of MINIMUM 20% of Train Tour Printed Tariff. Full Balance tour amount must reach us at least 60 days before tour depart with passport details of all the passengers. To issue e-travel documents we require full tour amount with photocopy of passports. Saloon/cabin names are allotted at time of check-in, at the Railway station with boarding cards. Passport details required include. Name / Nationality / Date of birth / Passport Number with Place & Date of Issue & Date of Expiry). If cancellation request is received less than 89 but greater than 30 days before of tour depart - minimum cancellation fee levy of 20% of total train tour ticket value. No amount will be refunded for cancellation made less than 30 days before departure. 100% of ticket value will be returned if the tour is cancelled 29 days prior to departure in case of group tours. No refund will be made if cancellation request is received between 0 to 59 days prior to train departure.